I hate public speaking. In fact, I have been known to throw-up before public speaking (my university car pool buddies can attest to that). But I’m getting better at it, and last week Grant and I got to test out public speaking skills at a local high school. 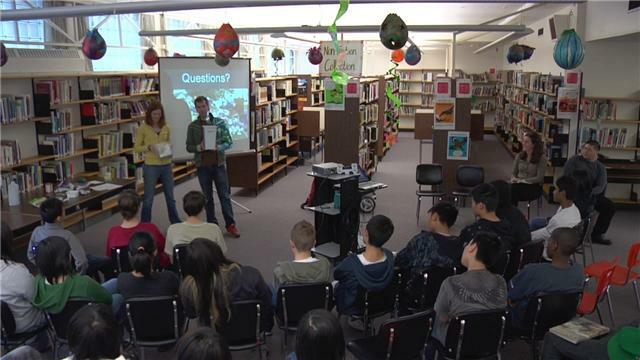 We spent a morning block with three classes of mostly grade 8’s from Charles Tupper Seconday. We showed the video of us on the news, we did a little presentation about the Clean Bin Project, we watched some of the Story of Stuff, and we brainstormed ideas for how the kids could reduce waste and consumption both at school and at home. When we started talking about the Clean Bin Project, we got a few blank looks, but once they got into the discussion and group work everyone had great ideas. They brainstormed things like cutting down on disposable dishes in the cafeteria, saving energy by turning lights off, having recycling for the bathroom paper towels, and taking fabric bags with them with they go to the mall. My favorite thing about kids is that they are so willing to take up a cause. The catch is that they won’t do anything because you tell them to. It’s better to just give them all the facts and let them think about it and come to their own conclusions. I’m not going to say we converted them, but it did spark some discussion. It was inspiring to see was all the things students were already doing to reduce their footprint. They’re working on recycling bins and a cafeteria compost and they have a sustainability club – all in their spare time no less. Some of the kids had worked with the woodwork teacher out of class time to design and make stylish wooden recycling bins with garbage, paper, and bottles and cans options. 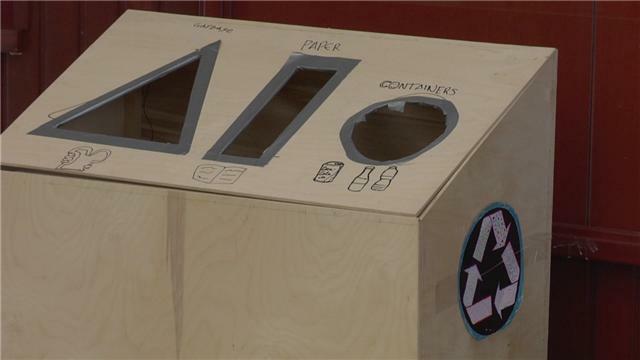 While we were there, the wood shop teacher proposed to the graphics class that they design an advertising scheme for the recycling bins to raise awareness and make people around the school actually use them. He approached it as if it was one business (the builders) approaching another (the advertisers). It’s real world experience, plus they’re learning to value the environment and work on projects that help, not hinder the earth. In the end, I was really happy with our presentation. It rejuvenated our commitment to the Clean Bin Project, and sparked all kinds of ideas for what we could do if we get an opportunity to go to a school again. Thanks to Miss Foell for inviting us! sounds wonderful, Jen. Well done you. I was terrified before doing the radio phone in, so I can’t begin to imagine how you felt before this! Sounds like it worked out really well and I love how the kids took up the cause. I had to write an article on 10 ways to reduce rubbish this morning and my 7 year old came up with 4 of the ideas straight away – they are awesome aren’t they?